What makes this genuine topaz from SWAROVSKI GEMSTONES interesting is it's bright poppy-orange color. The gem is a 6mm cushion-cut orange topaz. This is what jewelry should look like: fun, fashionable, and indelibly unique. 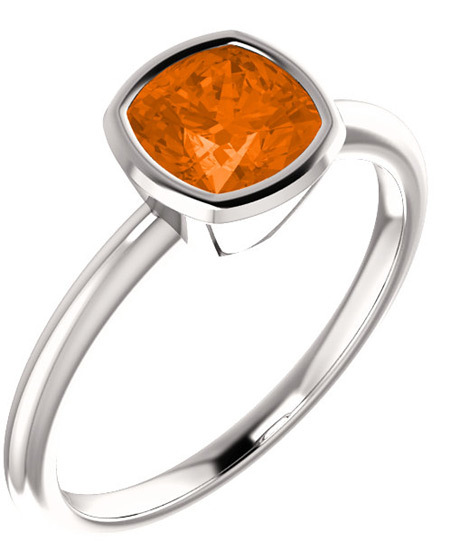 The center gemstone is a cushion-cut antique-square orange topaz bezel-set in a .925 sterling silver ring. The ring is available in women's sizes 4.5 - 9 and also available in 14k white gold (shown below). Band measures 1.75mm wide and the orange topaz is 6mm x 6mm in size. We guarantee our Orange Topaz Sterling Silver Antique-Square Bezel-Set Ring to be high quality, authentic jewelry, as described above.